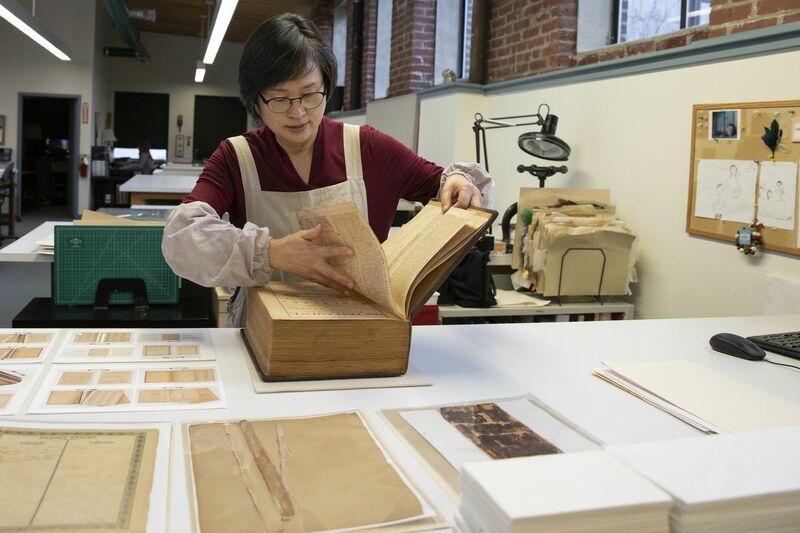 Jungohk (Theresa) Cho, who restored Betsy Ross’ family Bible, flips through its pages in the lab at the Conservation Center for Arts and Historic Artifacts. For decades, Betsy Ross’ Bible sat open to the same page inside the narrow Arch Street rowhouse where she is said to have sewn the nation’s first flag. On the exposed paper was the Ross family tree, written in script but rendered illegible in places, a faded and discolored victim of humidity, heat, and the sun’s rays. By the time Lisa Acker Moulder joined the historic house museum as collections manager in 2000, the Bible, published in 1791, was in such fraught condition that she stashed it away in storage, displaying it only for the few days in 2015 that Pope Francis was in town. Soon, though, the Bible will re-emerge, refreshed after a four-month stay at the Conservation Center for Art and Historic Artifacts in Center City, and will return to its home, where it will be put on limited exhibition. The $11,000 preservation project came of a partnership between Historic Philadelphia, the private nonprofit that operates the Betsy Ross House, and the American Bible Society, an organization that has been promoting the Good Book for the last two centuries. In 2015, ABS moved its headquarters from New York to Fifth Street near Independence Hall, where it is building a museum themed to the role of faith in American history. Betsy Ross' family Bible at the lab of the Conservation Center for Arts and Historic Artifacts in Rittenhouse. ABS has an extensive collection of rare Bibles, including Helen Keller’s. Funding the restoration of the Ross family Bible fit into the group’s “sweet spot," said Patrick Murdock, managing director of ABS’s Faith and Liberty Discovery Center, which is expected to open in 2020. Before the collaboration, the Betsy Ross House had only a limited preservation budget, Moulder said. Historic Philadelphia had tried to raise the funds by displaying the Bible during the pope’s visit, hoping that tourists visiting the city for a religious event might donate to save it. The appeal brought in $50. But with ABS support, the ailing Bible could be checked into the Conservation Center, which has preserved Frank Lloyd Wright’s architectural drawings, John James Audubon’s Birds of America prints, and Bruce Springsteen’s lyrics notebooks. When it arrived in October, the Bible’s leather covers were detached and the binding crumbled. The book was split apart into two sections. Pages were discolored, stained, and brittle, and some had been torn out. It had been given to Ross at the behest of her aunt Sarah Halloway, who had stipulated in her will that Bibles be purchased for some of her nieces and nephews after both she and her brother, Samuel Griscom, Ross’ father, died, in 1789 and 1793 respectively. Ross received her Bible in 1794, nearly two decades after she is said to have sewn the first flag in the upholstery shop/boarding house where she lived and worked as a young widow in 1776. Inside the Bible is a family tree created by Ross’ third husband, John Claypoole. Among the relatives it lists are the couple’s parents, children, and some grandchildren. Ross had two daughters with her second husband, Joseph Ashburn, and five daughters with Claypoole, but two of her children died in infancy. A page with record of deaths inside Betsy Ross' family Bible. Ross’ signature does not appear in the Bible, but can be found on a separate page tucked into the book on which she, as Elizabeth Claypoole, and John Claypoole signed their names. Following her death at age 84 in 1836, the Bible was passed down in the family. It was donated to the Betsy Ross House in 1949 by three descendants, Catherine B. Swift, John Balderston, and Esther Jones. At that time, Charles Vexil Domus Weisgerber was running the landmark. His father, artist Charles Weisgerber, had been instrumental in the house’s 1898 transformation into a museum after earlier incarnations as a general store, shoemaker’s shop, and tavern. “Back then, the house wasn’t run by museum professionals, who wouldn’t have left an open book out for years at a time,” said Moulder, now director of the Betsy Ross House. The Bible was exhibited on a shelf in a corner cupboard, near a window in the parlor. It was there that George Washington, Robert Morris (the “financier” of the American Revolution), and George Ross (a signer of the Declaration of Independence and the uncle of Betsy’s first husband, John Ross) are said to have met with her to ask her to make the flag. At the Conservation Center, the damaged book, which previously had been treated by other experts, landed in the hands of Jungohk “Theresa” Cho, senior book conservator, who spent 50 hours repairing it. Carol Spacht portrays Betsy Ross at the Betsy Ross House in Old City. Cho resewed detached pages and repaired the book’s fragile spine by using its crumbling leather and adding new material. She reinforced the leather cover with special paper, toning it to blend with its original color. She cleaned up some browned and faded pages including the family tree, which could once again be read. Next, the Betsy Ross House is seeking funding to preserve Dolly Kaboo, a one-of-a-kind Quaker doll made of wood that belonged to Ross’ granddaughter.